Depending on sizes and subject to availability. Maximum value $250.00 USD. "Captures the joy and simplicity of a fall day. You want to be a part of this dream. The amount of detail, wrinkles on old man and overalls the boy is wearing, really brings to life the emotion. Like how the trees extend above the shoebox." "This entry has its own uniqueness (there aren't any people or animals) and simplicity that makes it stand out. 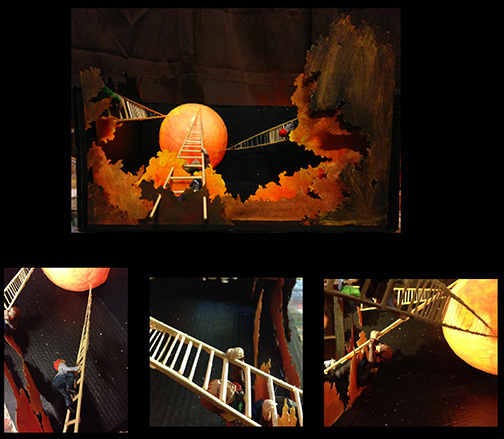 The attention to detail of all the components really makes it life-like." 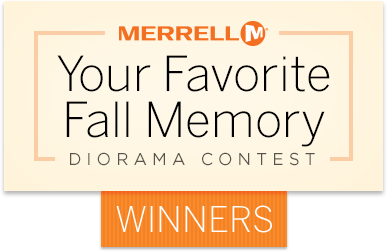 The results are in for the Merrell Diorama Contest! 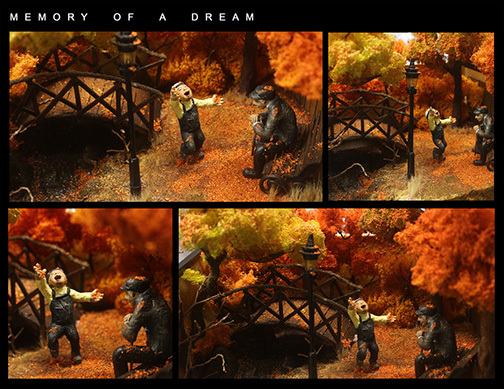 We challenged you to depict your favorite fall memory using a shoebox, and the winners have been chosen. Check out what Merrell's VP of Global Marketing had to say about the top choices, and relive these treasured memories! Congratulations to the winners! 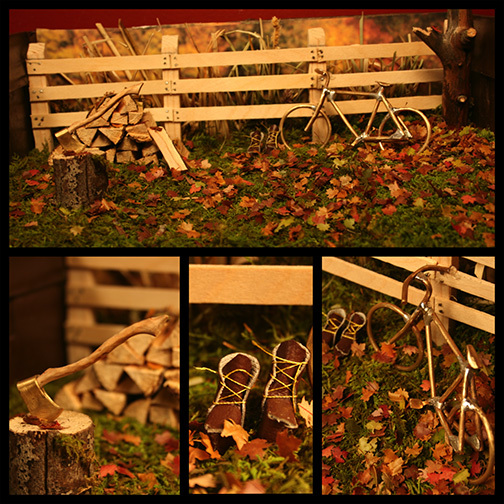 Marvelous displays that truly exhibit and capture the majestic Autumnal essence! Awesome job, winners! I saw many unique and beautifully put-together entries. Good job, everyone! Lovely work! I especially like 2nd and 3rd places. Congrats to the winners of the contest! They're all so amazingly beautiful! Well done all, these are really lovely pieces! Congratulations to the winners! Your works are all amazing! Impressive works, all three! Congratulations to the artists! Congrats to the winners, all well deserved! Tottaly agree with the winners! Wow, all the winning artworks look fantastic! Congratulations! These are amazing entries. Congratulations to the winners! Congratulations to all the winners! Really nice! Epic! Congratulations to all of the beautiful entries! CONGTRATS to all that won and entered!! All the three of them really deserved it. all of this creations are so AWESOME!! Those are all so beautiful! Congratulations to the winners! This is hands down one of the most beautiful contests deviantArt has sponsored. Congrats. Amazing entries! Huge congrats to the winners!!! The results are in! You submitted your space in need of an art upgrade along with the perfect Framed Fine Art Print to bring the area to life. We received an outpouring of awesome photographs, and thank you for sharing your space with us! We're ready to announce our top 20 Winners, who will receive the Framed Fine Art Print they chose*, up to 20"x30", as well as our 30 Runners-Up, who will receive 800 Points and a one-month Premium Membership. Congratulations, one and all! *Subject to deviantART's Print review process. Thursday: Random Phrase Art Contest!Happy Thursday! I hope you all had a great Thanksgiving last week, and are rested up and ready for an art contest this week! Using a random phrase generator, your task is to make a piece of art depicting your random phrase! Use this random phrase generator to get a random two-word phrase. It's best to use the first one that comes up, but you may choose another. Draw this phrase, depict it in a photograph, or write about it! Any medium is accepted. However this phrase inspires you, we want to see it! Upgrade Your Space Semi-Finalist AnnouncementIn the Upgrade Your Space contest, we challenged you to show us the space in your place that needed a little artistic improvement. There were great photographs submitted, as well as fantastic Fine Art Prints selected, which made us feel right at home. From these 50 Semi-Finalists, the 20 Winners will be chosen, who will receive the Framed Fine Art Print they chose, up to 20"x30"! (subject to deviantART's Print review process). Congratulations to these deviants! And remember, even if you aren't listed here, the deviantART Free Shipping Event begins this Monday, October 29th, which means that you'll be able to get the Print or deviantART Gear item of your dreams with free shipping! Photography: Your Thoughts?Within this article we (myself and 3wyl) are looking for your feedback on specific areas of the Photography Galleries and in particular what you'd like to see happening with regards to the following.. Craft a Moustache ContestWhat is Movember? During the month of November each year, Movember asks men across the world to grow a moustache (or Mo') with the aim of raising vital funds and awareness for men’s health issues. Mo Bros are helping to change the face of men’s health by effectively becoming walking, talking billboards for the 30 days of November and through their actions and words raise awareness by promoting private and public conversation around the often ignored issue of men’s health. Together, we are truly changing the face of men’s health. PE DD Week: A DD is not an award, but a feature. A DD is not an award but an art feature. There. I said it. A DD is not a prestigious award that will change your life drastically, it's just a 24h feature. But why is it so important to make this distinction? It's just a way of naming something and therefore should not be of great importance, yet it makes all the difference in how people perceive a DD. The catch is that you only get 10 minutes to do your entry! Yes! Each one of these was created in just 10 minutes! Winners of the devID Spooky Make-up Contest!I'm extremely happy to announce the winners of the devID Spooky Make-up Contest!! If you're interested, you can view all of the entries here. 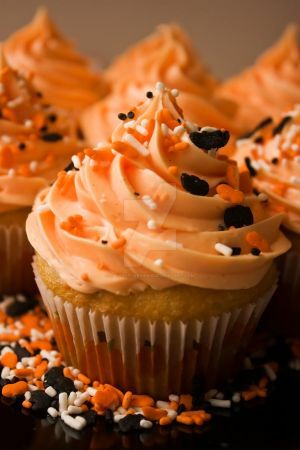 Nom Nom 23# Halloween Special Happy Halloween!!! Photography Troubleshooting: Capturing BabiesOkay so one of the biggest subjects within portraiture photography are infants and children! Children and in particular newborn babies bring out the photographer in all of us. So whether or not you're looking to go pro and snap babies professionally or whether you just want to brush up on some tips for your own family or friends, this could be the article for you! I always thought that when I got my first baby shoot booked, it would just be a case of snapping them on the carpet or wrapped up in a blanket. I had no idea how creative I could really get - and how simply it would be to do that.